A spoonful of coconut oil can change your life. Don't take our word for it — try it yourself! I’m a bit of a hypochondriac. I immediately assume a dry patch of skin is psoriasis (it was eczema). I diagnose myself with kidney failure when I feel a sharp pain in my side (it was gas). And I know I’m not the only one. So when I learned about the coconut oil uses that can transform your mind and body, I just had to see if they were true! As members of the too-much-information generation, many of us follow the same pattern. We replace a visit to the doctor with a scroll on WebMD. But there is a positive result to this constant impulse to look things up online: you find preventative measures to stay healthy so that you aren’t begging for antibiotics after each sniffle. One of the easiest, and tastiest, ways to boost your overall health is by eating coconut oil. Not shredded coconut, not minced coconut, not a coconut daiquiri. You have to ingest unrefined or raw coconut oil in order to reap its multitude of benefits. Luckily, coconut oil is a delicious and versatile ingredient! You can use it to sautée veggies, fry meat, and bake cookies, or you can do what I do and just throw back a tablespoon every morning! However you incorporate it into your diet, just make sure you buy your raw coconut oil in bulk — because once you read these coconut oil uses and learn how it can stave off everything from uncomfortable issues to dangerous diseases, you won’t stop using it! About 90% of coconut oil is made up of a variety of saturated fats. But don’t fear the f-word. 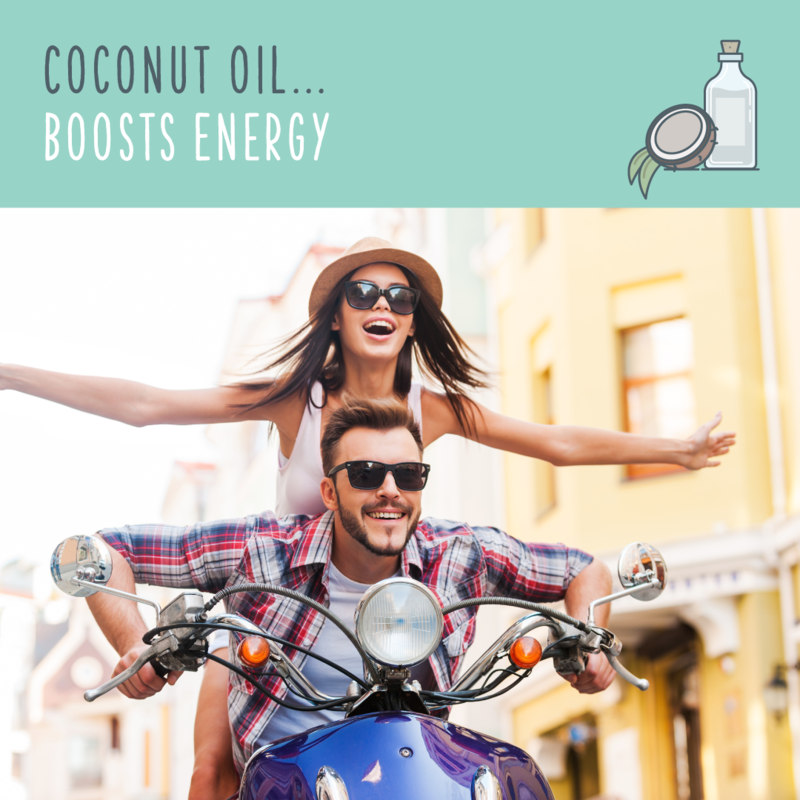 Consuming raw coconut oil can help boost energy levels, regulate your digestive system, kill harmful bacteria, fight off infections, and do so much more. The unique combination of medium chain triglycerides (MCTs) found in coconut oil have astounding effects on the human body. Caprylic acid, lauric acid, and capric acid are three medium-chain fatty acids (MCFAs or MCTs) which make up 62% of coconut oil. Coconut oil has so many naturally beneficial components that it’s one of the few foods worthy of the “superfood” moniker! Overall health benefits of coconut oil include antifungal, antibacterial, antioxidant, and antiviral properties. So basically, just bathe in a vat of coconut oil for healthy skin, hair, and organs. The Coconut Research Center reports that coconut oil can be used to combat the following: viruses that cause influenza, measles, hepatitis, herpes, and SARS; bacteria that cause ulcers, throat infections, urinary tract infections, pneumonia, and gonorrhoea; fungi and yeast that cause ringworm, athlete’s foot, thrush, and diaper rash. Remember: the information below is based on our research into the health benefits of coconut oil, but you should always consult your doctor before adding a supplement to your diet. Green Future is not encouraging you to replace your current medication with coconut oil. 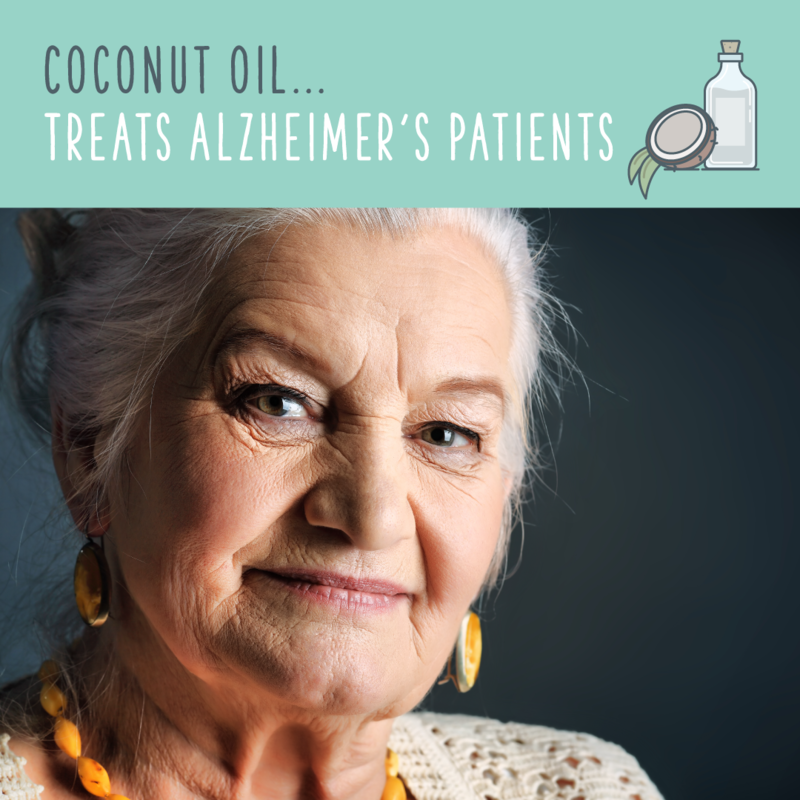 Rather, we want to enlighten you on the natural relief that coconut oil can provide. 1. 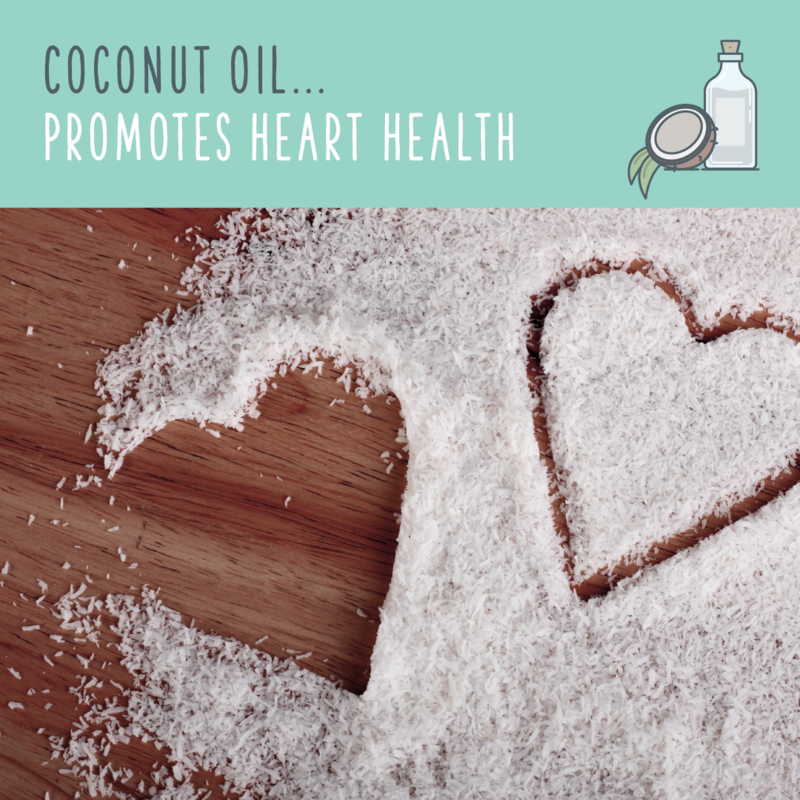 Promotes Heart Health: Coconut oil contains about 50% lauric acid, which aids a variety of heart problems including high cholesterol and high blood pressure. Despite coconut oil’s high saturated fat content, it boosts HDL cholesterol levels (the good cholesterol), which lowers your risk for heart disease if it’s used long term. 2. 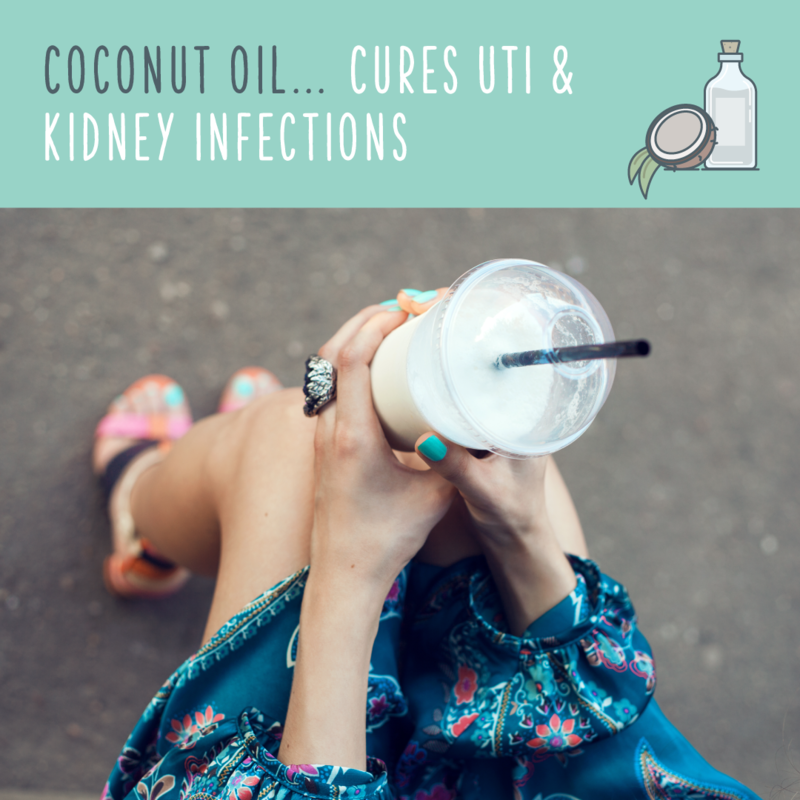 Cures UTI And Kidney Infections: Coconut oil works as a natural antibiotic by breaking up the lipid coating on bacteria in order to efficiently kill off the bacteria. Coconut oil also helps enhance the healing process and rehydration of your liver. 3. 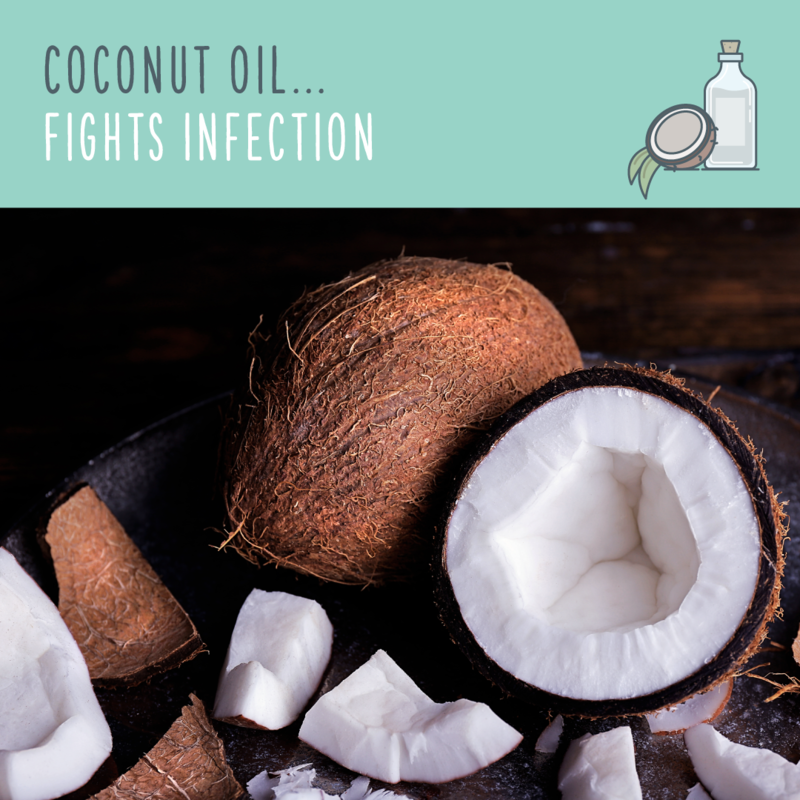 Fights Infection: Along with kidney and urinary tract infections, the lauric acid in coconut oil can also help combat harmful pathogens like viruses, fungi, and bacteria. Studies have shown that the lauric acid, and monolaurin created during digestion of lauric acid, can kill a range of bacteria including Staphylococcus Aureus (a common, serious infection known as staph) and Candida Albicans, which is a common source of yeast infections. 4. 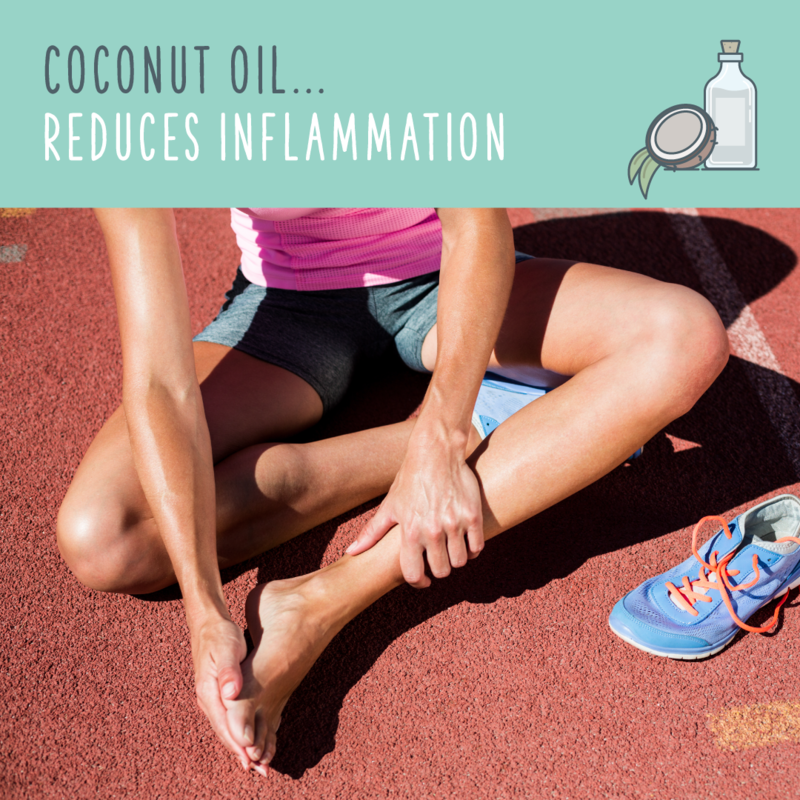 Reduces Inflammation: The high levels of antioxidants found in coconut oil greatly reduce inflammation and can ease the pain of inflammation-related disorders, such as arthritis. 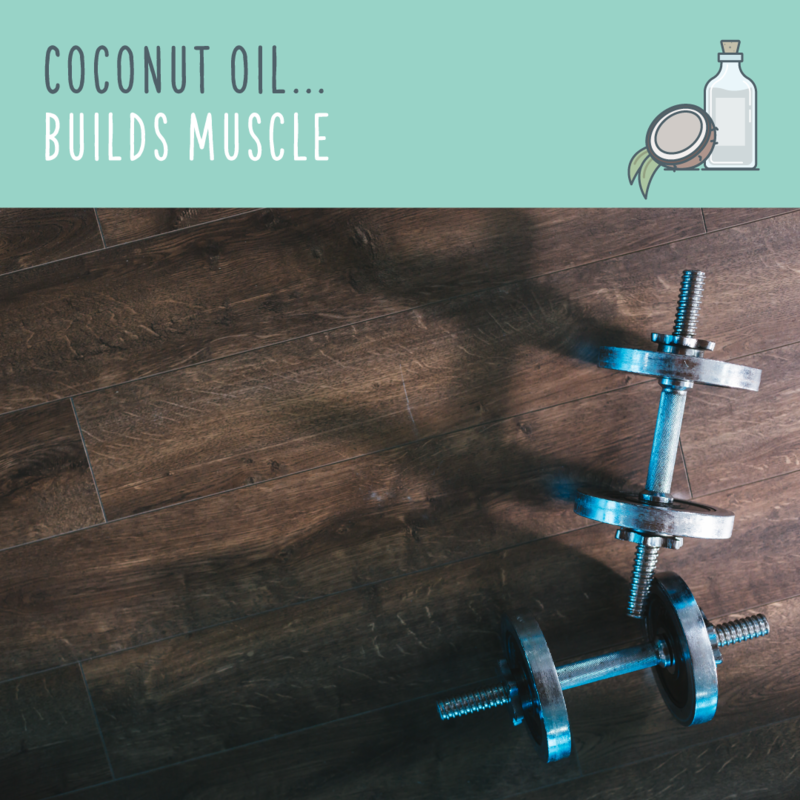 Coconut oil can even help prevent muscle aches, soreness from exercise, and stiff joints. 5. Boosts Immune System: The antibacterial, antifungal, and antiviral properties in coconut oil create an unpleasant environment for viruses. This lowers, or eliminates, the risk for many diseases which are caused by the presence or overgrowth of bacteria, parasites, viruses, and fungi in the body. 6. Improves Digestion: The medium-chain fatty acids (MCFAs) that make up coconut oil are easier to digest than other fats. These fatty acids also kill off various bacteria and parasites which cause indigestion or digestive problems, such as irritable bowel syndrome. These glorious, all-powerful MCFAs also enhance your body’s absorption of nutrients, which does wonders for your digestion and overall health. 7. 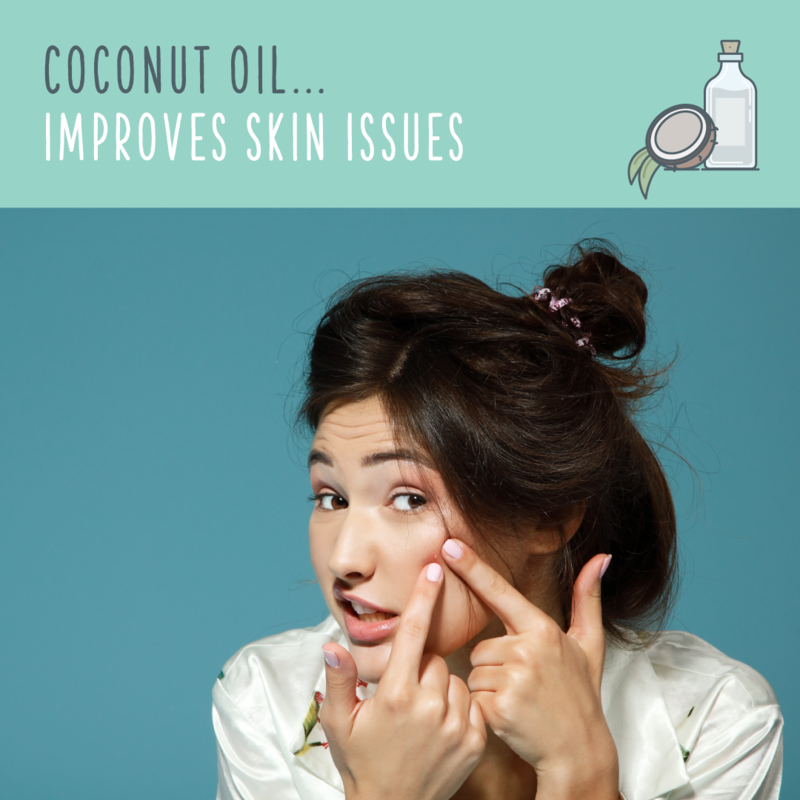 Improves Skin Issues: Coconut oil has intense hydration and healing powers when applied to your skin, and it can do the same job from the inside out. 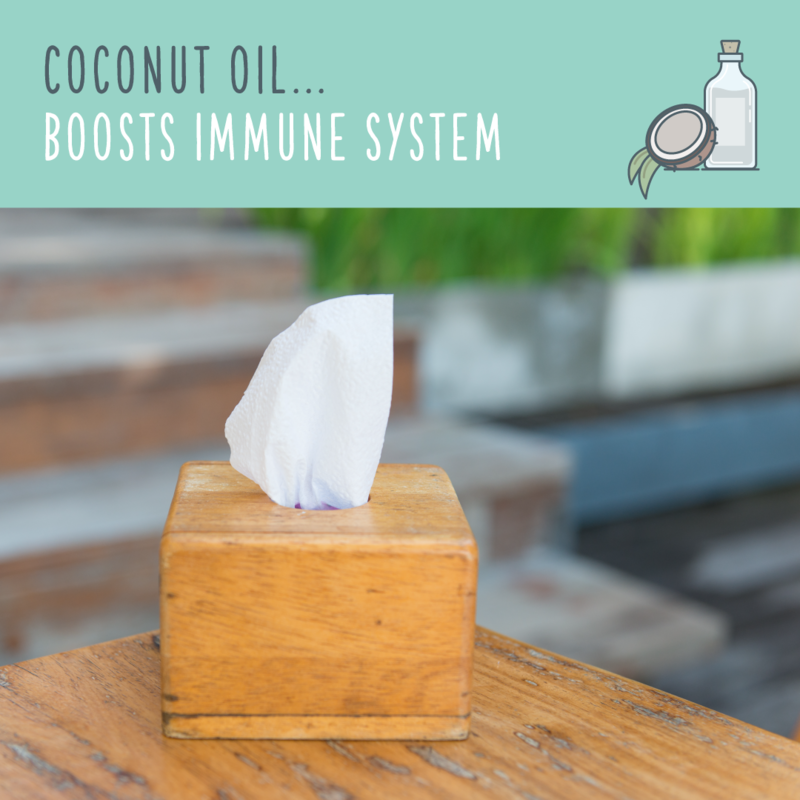 By cooking with coconut oil, or simply eating a portion per day, you can prevent or help ease symptoms of eczema, cold sores, dry hands, psoriasis, and dandruff. 8. 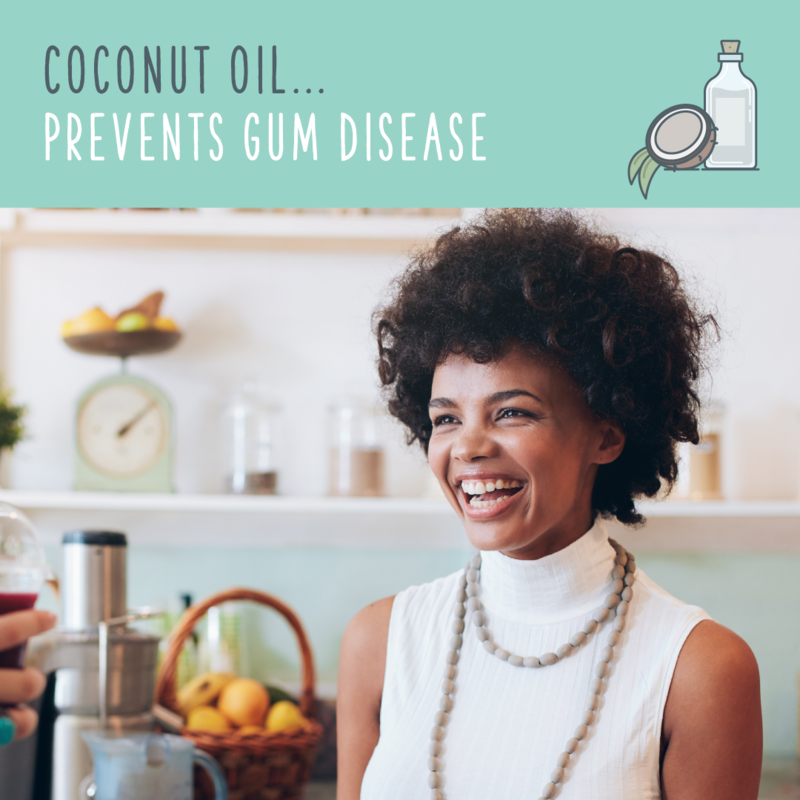 Prevents Gum Disease: Oil pulling with coconut oil is a simple way to rid your mouth of bacteria and lessen the risk of tooth decay and gum disease. It can also whiten teeth, prevent bad breath, heal cracked lips, prevent cavities, heal bleeding gums, and strengthen your gums! All you need to do is swish with one to two teaspoons of raw coconut oil for 20 minutes. I know it seems a like a long time, but it’s just long enough for plaque and bacteria to break down. Spit the oil out, rinse thoroughly with warm water, and lightly brush your teeth to get rid of any lingering bacteria. 9. 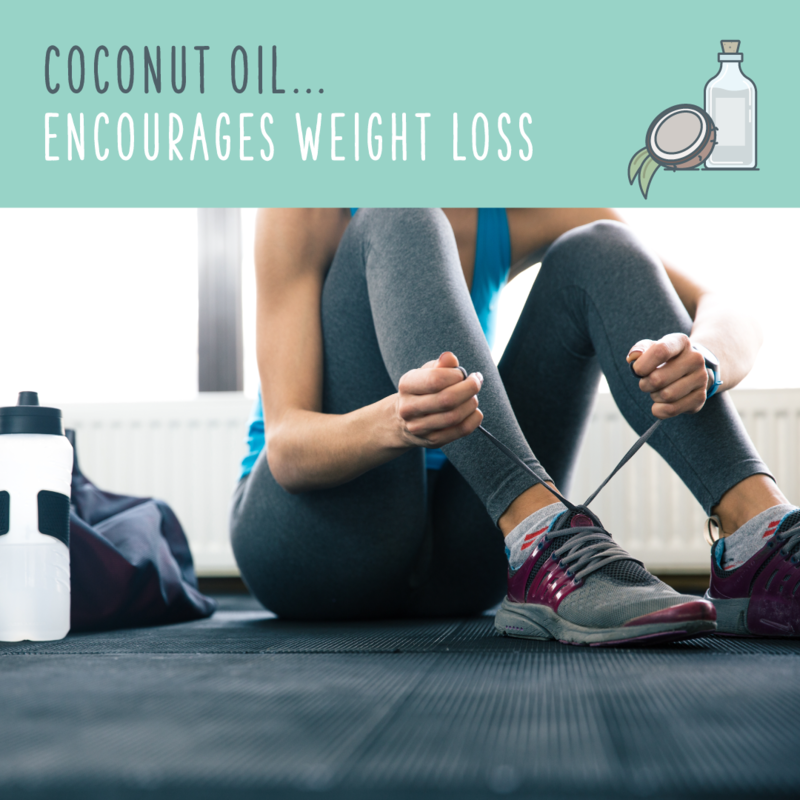 Encourages Weight Loss: Coconut oil encourage weight loss in a number of significant ways — many of which have to do with how the body reacts to the high concentration of MCTs found in coconut oil. It has a lower calorie content than other fats. It boosts energy and endurance. It is processed directly by the liver and efficiently converted into energy for muscles and organs, instead of being stored as fat. It contributes to faster metabolic rates, which burns more calories. It can act as an appetite suppressant. 10. Boosts Energy: MCTs give you an immediate energy boost because they go through a three-step process in order to be turned into energy — compared to other fats which go through a 26-step process before they are classified as energy. Scientists also credit the increased energy from MCTs with the rapid formation of ketones. 11. 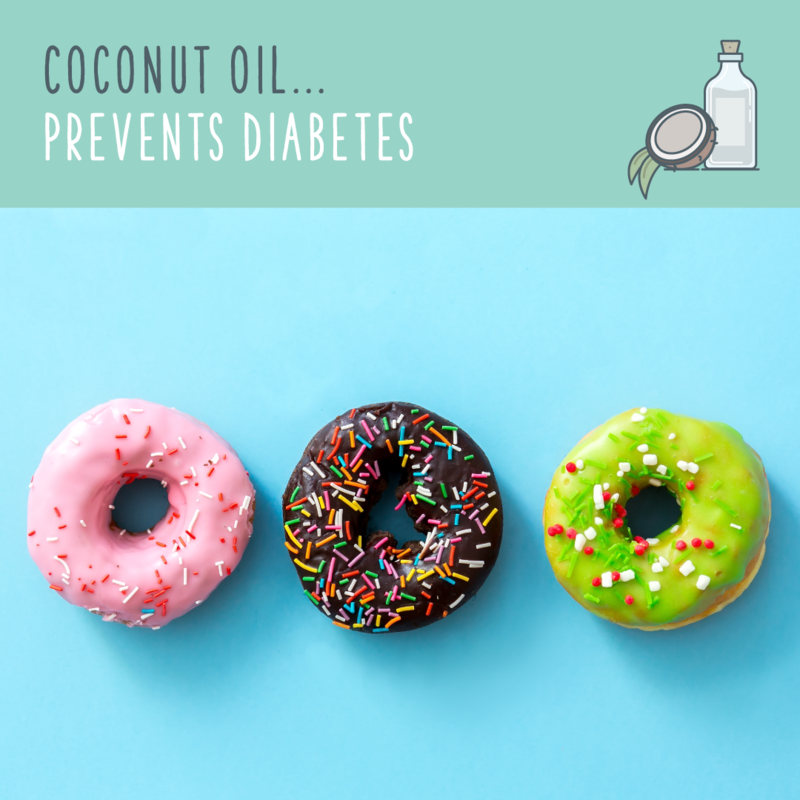 Lowers Risk Of Diabetes: The MCFAs in raw coconut oil can help combat diabetes in two ways. They have a slight hypoglycemic effect, and they help balance insulin reactions to promote a healthy digestive process. Due to the lack of research on human patients, it is important to discuss any and all supplements with your primary care physician before adding them to your diet. 12. 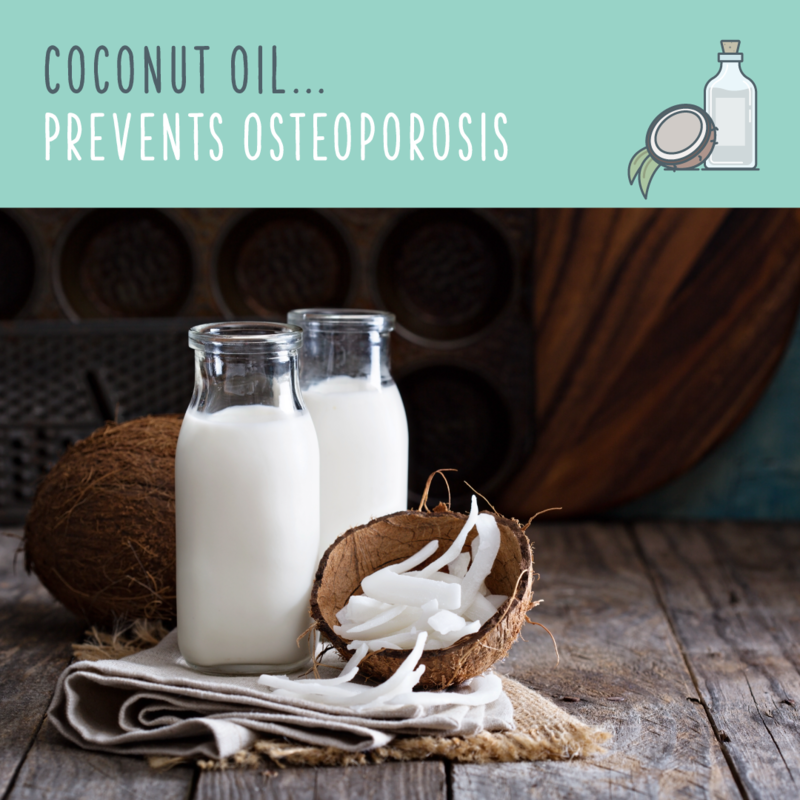 Prevents Osteoporosis: Eating coconut oil can help increase bone strength and prevent osteoporosis. 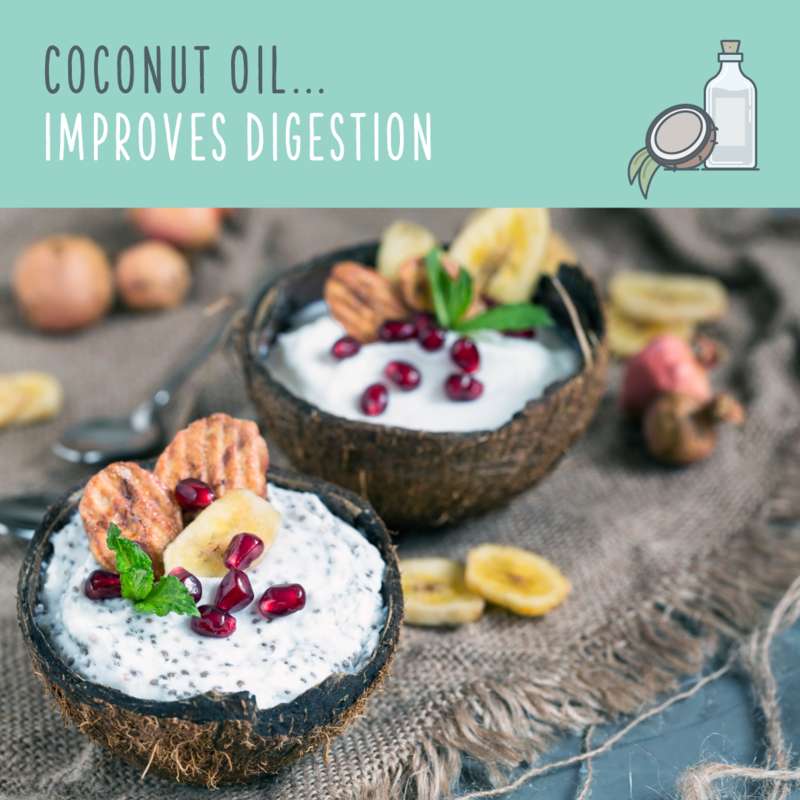 Alongside aiding digestion, coconut oil makes it easier for your body to absorb calcium, vitamin D, and other nutrients crucial to bone strength. The antioxidants in coconut oil also fight and eradicate free radicals which can cause osteoporosis. The human brain uses one of two substances to create energy: glucose or ketones. Normally, the brain creates its own insulin to power brain cells by converting glucose into energy — but the brain of an Alzheimer’s patient loses the ability to create insulin. When MCFAs are digested in the liver, they create ketones. Ketones send energy to the brain and can help repair brain function. 14. Builds Muscle: You don’t need an expensive protein supplement to help get ripped. The active ingredient in those powders are the same MCTs which are found in coconut oil! Since organic coconut oil uses natural MCTs, instead of processed forms, you’re getting an even better dose. How do coconut oil uses are part of your daily routine? Let us know in the comments below! "One of the easiest, and tastiest, ways to boost your overall health is by eating coconut oil."